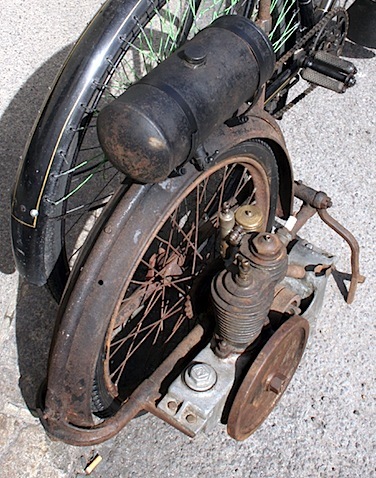 In my opinion, the most important cyclemotor model of the many hundreds of types produced throughout the 20th century is undoubtedly the Wall Auto-wheel. 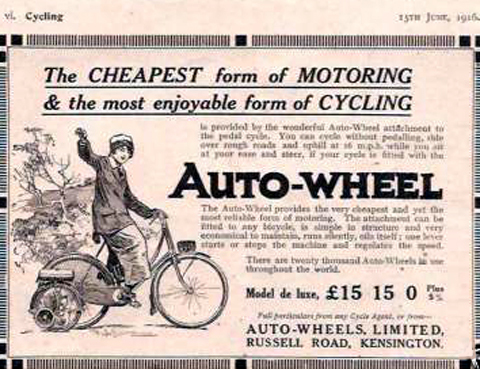 Absolutely brilliant in its design concept in terms of functionality and ease of attachment to the host cycle, the Auto-wheel influenced manufacturers for decades to come, who obviously had to use its design as a benchmark for the quality of their own product. 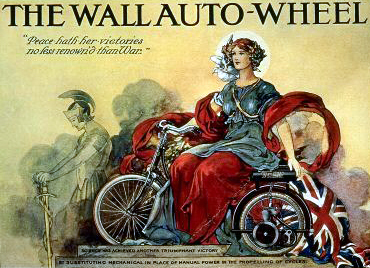 This Wall Autowheel was attached to a restored 1914 Humber Ladies cycle, a bicycle I owned for several years. I sold the pair of them in July 2008 to a gentleman in Germany. The Ladies Humber was sympathetically restored, and rode well, while the Wall Autowheel engine was unrestored. I’ve owned quite a few of these autowheels over the last 25 years. I can still picture them leaning against piles of spares back in the magic old days of Beaulieu autojumble; they were buyable for £50-£100 when I started to collect them, slowly rising in value through the 80’s. These days they remain by far the cheapest option if you wish to enter the prestigious annual London-Brighton Pioneer Run. 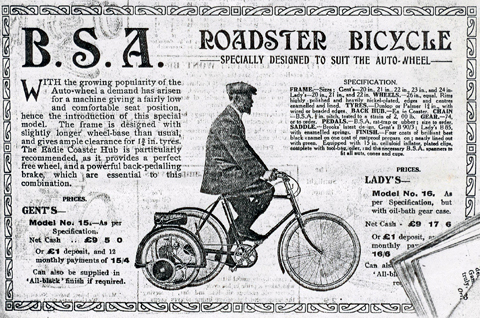 What other pre-1914 motorcycle can you buy this cheaply to officially ride those hallowed 60 miles? 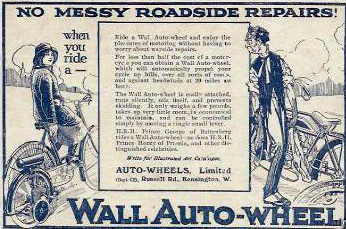 Footnote: The above advert claims NO MESSY ROADSIDE REPAIRS when you ride a WALL AUTO-WHEEL. 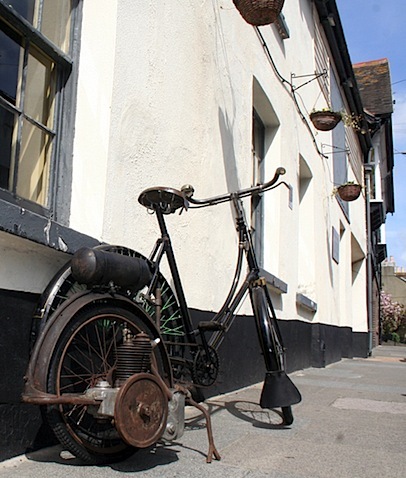 What it neglects to mention is that you’ll probably have to pedal it home when it stops working. I’ve now bought another Wall Autowheel. It was previously owned by Ian McGill, who organizes the Pioneer Run. Ian had it in his attic for many years and decided to sell it as he never quite got round to finishing it off. It’s mostly there. A friend will give me the missing parts so I’ll soon have it built up. I’ll add photos when it’s fitted. Just for fun, I intend fitting it to my 1913 Dursley-Pedersen. 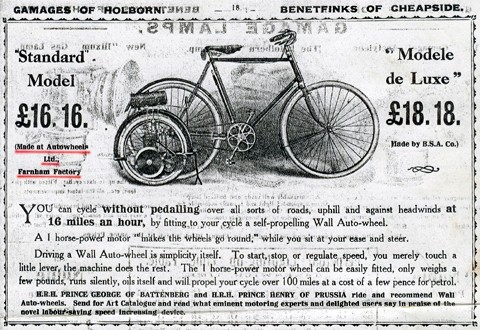 It is not the most practical of applications for the Wall Autowheel, nevertheless it was offered as an option in the Autowheels catalogue of the time. Here’s a photo of one on the Pioneer Run in the 1950s. In the Dursley Pedersen Study Guide (below), frame number 6522 is shown as fitted with a Wall Autowheel. I wonder if it’s the one in the above photo? The photo below is a more recent photo of the same machine, kindly sent to me by the owner.